Contribution of multiparametric magnetic resonance imaging in the diagnosis, staging and treatment of prostate cancer. To elucidate the role of multiparametric magnetic resonance imaging (mpMRI) in the diagnosis, staging and management of prostate cancer. 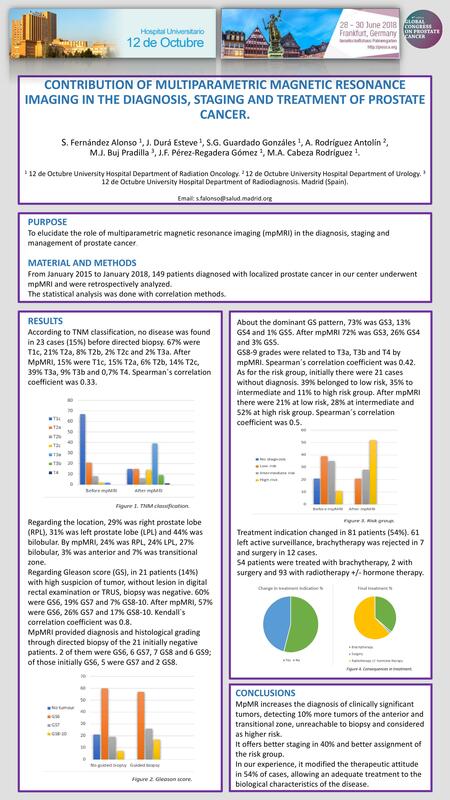 From January 2015 to January 2018, 149 patients diagnosed with localized prostate cancer in our center underwent mpMRI and were retrospectively analyzed. The statistical analysis was done with correlation methods. According to TNM classification, no disease was found in 23 cases (15%) before directed biopsy. 67% were T1c, 21% T2a, 8% T2b, 2% T2c and 2% T3a. After MpMRI, 15% were T1c, 15% T2a, 6% T2b, 14% T2c, 39% T3a, 9% T3b and 0,7% T4. Spearman´s correlation coefficient was 0.33. Regarding the location, 29% was right prostate lobe (RPL), 31% was left prostate lobe (LPL) and 44% was bilobular. By mpMRI, 24% was RPL, 24% LPL, 27% bilobular, 3% was anterior and 7% was transitional zone. Regarding Gleason score (GS), in 21 patients (14%) with high suspicion of tumor, without lesion in digital rectal examination or TRUS, biopsy was negative. 60% were GS6, 19% GS7 and 7% GS8-10. After mpMRI, 57% were GS6, 26% GS7 and 17% GS8-10. Kendall`s correlation coefficient was 0.8. MpMRI provided diagnosis and histological grading through directed biopsy of the 21 initially negative patients. 2 of them were GS6, 6 GS7, 7 GS8 and 6 GS9; of those initially GS6, 5 were GS7 and 2 GS8. About the dominant GS pattern, 73% was GS3, 13% GS4 and 1% GS5. After mpMRI 72% was GS3, 26% GS4 and 3% GS5. GS8-9 grades were related to T3a, T3b and T4 by mpMRI. Spearman´s correlation coefficient was 0.42. As for the risk group, initially there were 21 cases without diagnosis. 39% belonged to low risk, 35% to intermediate and 11% to high risk group. After mpMRI there were 21% at low risk, 28% at intermediate and 52% at high risk group. Spearman´s correlation coefficient was 0.5. Treatment indication changed in 81 patients (54%). 61 left active surveillance, brachytherapy was rejected in 7 and surgery in 12 cases. 54 patients were treated with brachytherapy, 2 with surgery and 93 with radiotherapy +/- hormone therapy. MpMR increases the diagnosis of clinically significant tumors, detecting 10% more tumors of the anterior and transitional zone, unreachable to biopsy and considered as higher risk. It offers better staging in 40% and better assignment of the risk group. In our experience, it modified the therapeutic attitude in 54% of cases, allowing an adequate treatment to the biological characteristics of the disease. Prostate cancer, magnetic resonance imaging, biopsy, diagnosis, staging, management.